David Bholat, Julia Kowalski and Simon Milward. Financial inclusion means every adult having access to fair and affordable savings, transactional banking, credit and insurance. It also requires consumers of financial services to be literate around their use. Whilst this sounds unobjectionably positive, expanding access to financial products can create new risks for financial institutions, financial stability and the financially excluded themselves. Policymakers around the world are grappling with how to balance financial stability with the broader goal of financial inclusion, and have responded in different ways. We believe central banks both in developed and developing countries can play a valuable role in promoting financial inclusion and that they need to consider financial inclusion if they are to promote the good of all the people they serve. Financial exclusion is not just caused by poverty but can actually create a vicious circle that keeps people in it. In the UK, it is estimated that individuals forced to rely on cash transactions pay a “poverty premium” of up to £1,300 per year. In addition, the introduction of Universal Credit creates a pressing need for greater inclusion as it will require benefit recipients to have a formal bank account. In recognition of its importance, financial inclusion is increasingly being talked about in policy circles, especially against the backdrop of current debates about inequality. At an international level, the G20 has defined financial inclusion as a core issue. The Basel Committee on Banking Supervision (BCBS) also recently published a study about financial inclusion and an article in its recent Quarterly Review discusses possible links to existing central banking objectives. 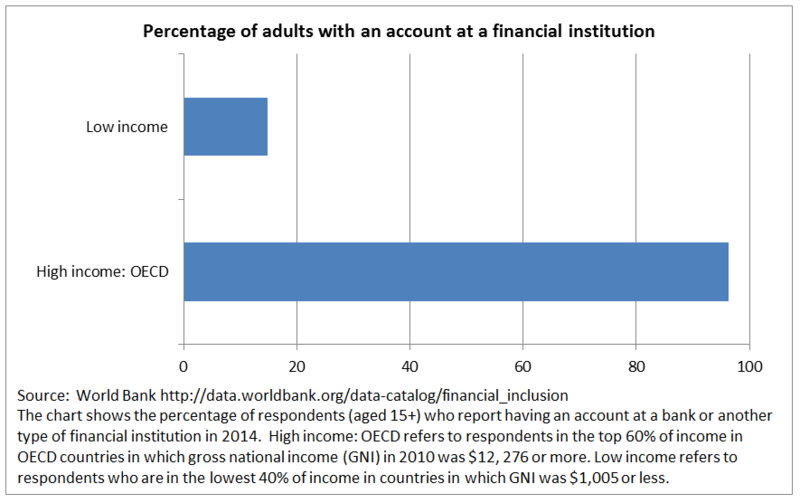 Financial inclusion also often features prominently in stories reported by centralbanking.com. 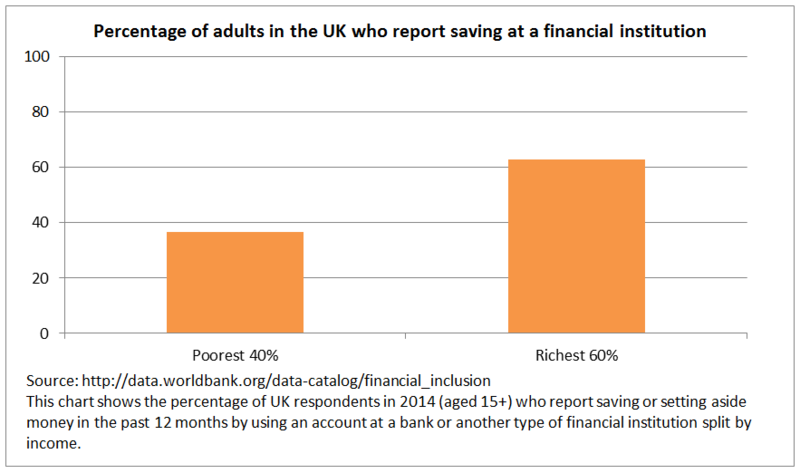 Finally, the Financial Inclusion Commission (FIC) has just released a report documenting financial exclusion in the UK. The FIC report makes for sober reading. As well as the nearly 2 million adults in the UK without a bank account, 13 million people don’t have enough savings to sustain themselves over a month if they experienced a 25% drop in income. And half of all low-income households don’t have household contents insurance. Perhaps most surprising is that more than half of the nearly 2 million adults without a bank account prefer not to have one. In many cases this appears to be because people are put off by potentially high penalty fees and charges, especially if they have had negative experiences with banks in the past. In other cases it seems to reflect a wider public distrust of banks following the financial crisis, and an unwillingness to act as creditors (depositors) to them. So while exclusion has significant costs, many people actually perceive disadvantages in being financially included, which raises the question of how best to pursue financial inclusion if it is an explicit policy goal. Below we discuss some of the advantages and disadvantages of greater financial inclusion and different paths towards its achievement. Achieving full inclusion will require a combination of top-down and bottom-up solutions that reflect the preferences of the financially excluded. We also set out various roles central banks can play. Increasing access to finance affects individuals’ financial health in sometimes conflicting ways. On the one hand, savings accounts, some insurance products and even affordable credit can help households withstand unexpected shocks such as unemployment or medical emergencies. This in turn can help reduce wealth inequality, positively influencing long-term economic growth and absolute poverty reduction. On the other hand, increasing access to credit is not universally beneficial. In some cases debt may paper over wider inequalities without addressing their root causes (i.e. access to credit as a poor substitute for growth in real wages). Credit can also create a spiral of debt where successive loans are made simply to repay interest from previous loans. In fact, more than 12,000 of the 70,000 people who sought help with payday loan debt in 2014 at StepChange, a UK debt charity, had five or more loans. Our view is that financial inclusion should be about making people more financially resilient with an emphasis on the ability to transact and save. Some encouraging innovations here include simple fee-free and charge-free bank accounts. These can be especially helpful if linked to savings goals or default savings created from change generated in purchases, as well as Jam Jar budgeting tools. The impact of greater financial inclusion on financial firms like banks is equivocal. On the one hand, widening access to transactional and savings accounts does not appear to impact financial stability adversely. In fact, it can broaden banks’ funding bases and low-income-household deposits also have been shown to be relatively stable with low volatility. Similarly, broadening lending operations by extending credit could enable banks to diversify their assets, which could positively impact long-term profitability. On the other hand, expanding access to credit for marginal borrowers can lead to instability in banks and the wider financial system, as seen in the US subprime mortgage crisis. Also, the financially excluded often lack previous credit histories, increasing the screening costs and risks of supplying credit to them. And while there are increasingly innovative approaches to evaluating borrower quality, such as by using psychometric tests or social media, these still have to prove their effectiveness over the long haul. 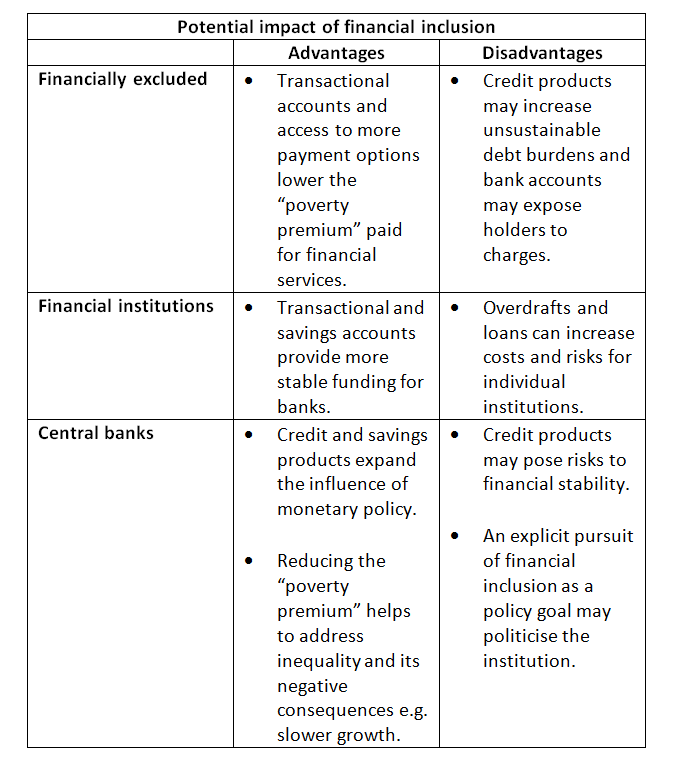 For central banks a variety of issues flow from increased financial inclusion. Increased use of formal financial services for savings and credit is likely to increase the potency of interest rates in monetary transmission as it expands the group of people directly affected by monetary policy. This could increase the ability of monetary policy to smooth consumption and thus stabilise aggregate demand and inflation following a shock. Overall, the efficacy of central bank monetary policy seems to be positively affected by an increase in financial inclusion, albeit marginally. There is, however, potential for greater inclusion to disrupt the stability of the financial system – for instance, extending credit could lead to excessive risk in financial institutions, as already discussed. Nevertheless, we believe central banks have a duty to serve the whole of the population in ways that enable as many people as possible to benefit from the financial system. One way they can do so is ensuring financial regulation does not stifle innovation. Much has been made of the impact of capital requirements on financial institutions’ ability to develop and extend products and services that benefit those currently excluded. But financial regulation also influences institutions through other channels. This includes hard influences such as via authorisations, permissions and requirements, and also soft influences via correspondence and discussion. Explicitly considering financial inclusion in all of these settings could make a significant difference to financial institutions’ interest and ability to tackle financial exclusion. Many central banks across the globe provide useful examples of what can be done to promote greater inclusion. Some central banks collect valuable data on financial exclusion in order to establish evidence on what works. Others provide financial literacy training to improve the usage of financial services or promote better infrastructure to reach the excluded. Thinking outside the box, central banks could even offer basic current accounts and other services directly to the financially excluded as a step to bring people into the financial system. In the UK, this might be especially effective for the 1 million adults who choose to remain unbanked due to previous negative experiences with the private sector. In sum, central banks inevitably have an effect on financial inclusion and we think they should explicitly consider this effect when setting policy. The best ways for central banks to influence financial inclusion are still open to debate. Currently, in the UK, we believe emphasis should be on promoting universal access to transaction and savings products. David Bholat works in the Bank’s Advanced Analytics Division, Julia Kowalski works in the Bank’s Major UK Banks Division and Simon Milward works in the Bank’s Major UK International Banks Division. Previous Post How important are households’ expectations for spending? Next Post Is starting a new market like opening a nightclub? The cheque republic: money in a modern economy with no banks. A question of interest: Is UK household debt unsustainable?